In general, sweet wines are not my thing. Matt loves them, but I can take them or leave them. I make at least one exception to that general rule every year with the Nelson Family Orange Muscat. All too often, Muscat can be an overly sweet mess, but not this one. I fell in love with this wine nearly 4 years ago and have enjoyed it ever since. Even though it is sweet, it has great acidity to back that up and the tropical flavors make me swoon. We pulled the 2007 Nelson Family Orange Muscat out of the basement to enjoy by the fire the other night. It had a real cork closure, clocked in at 14.5% alcohol by volume, and cost me $16.80 in a club shipment. On the nose I found pineapple, apricot, tropical fruit, jasmine, flowers, and exotic spice. In the mouth I got pineapple candy, apricot, honey, and honeysuckle. This wine has acidity to spare and the flavors are enough to make a Muscat believer out of me. It sells out very quickly every year, and I believe the 2007 is already gone…but the 2008 should be right around the corner. You know I like something when my notes are peppered with the word “lovely” no less than 5 times! One major benefit of wine clubs that I rarely think about is that you often get new vintages of the same wine, and can compare them! I currently have a vertical of Michael Schlumberger Cabernet Sauvignon from 1998 through 2004…wondering how long I’ll save them until I hold a big party to taste through. But in any case, the wine this evening also benefits from my club subscription as I’ve already written about the 2005, just drank the 2006, and the 2007 just arrived the other day. 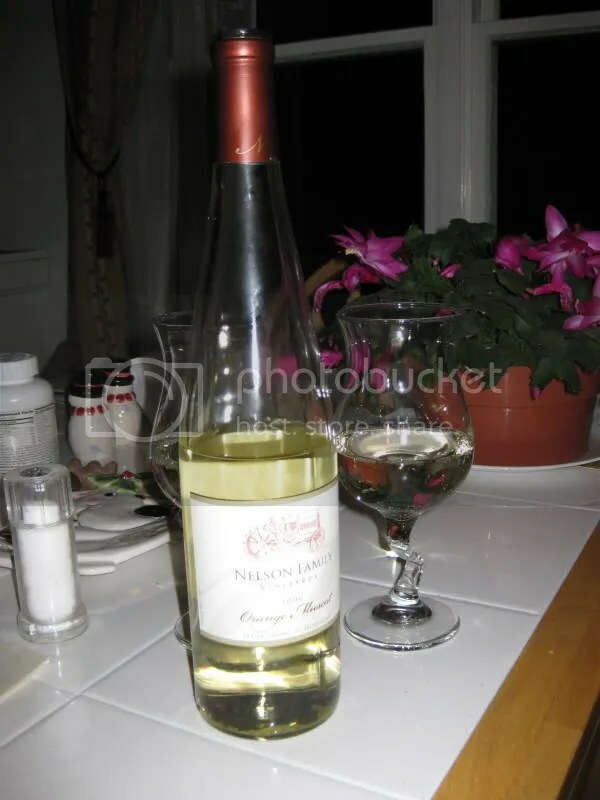 Today we’re talking about the Nelson Family Vineyards 2006 Orange Muscat. It had a plastic cork closure, clocked in at 14.8% alcohol by volume, and cost me $16.80 in a club shipment. I’ve loved this wine from my first taste of it in the Nelson Family Vineyards tasting room in 2006. Then, it was the 2005 and it convinced me to join the Nelson Wine Club. On the nose of the 2006 I found pineapple, honey, spice, lychee, orange, lemon zest, and ginger. I loved the spicy quality that this wine has. In the mouth I got citrus, tropical fruit, pineapple candy, ginger, and mandarin orange. The wine is on the sweet side, but it has nice acidty to carry it through. I love this wine. And I am not one for sweet wines. But I absolutely adored this bottle of wine when we bought it (the last bottle available at the winery!) and can’t wait to drink more of the 2006 either. 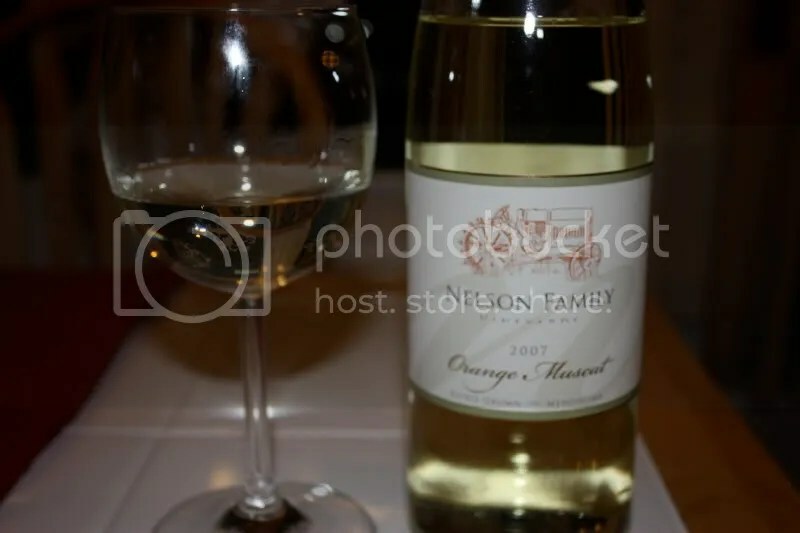 The wine in question is a 2005 Nelson Family Vineyards Orange Muscat. We picked this bottle up at the vinyard, where it cost us $16.18 (that’s with a club discount), clocked in at 14.5% alcohol by volume, and had a real cork closure. The aroma of the wine is very perfumed. I found scents of flowers, honey, orange blossom, and lemon zest. I could smell this bottle of wine for hours. 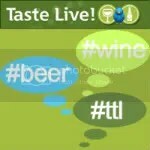 In the mouth the wine is sweet, but has the acidity to hold the sweetness in check. I found orange, mandarins, lemons, and honeysuckle. 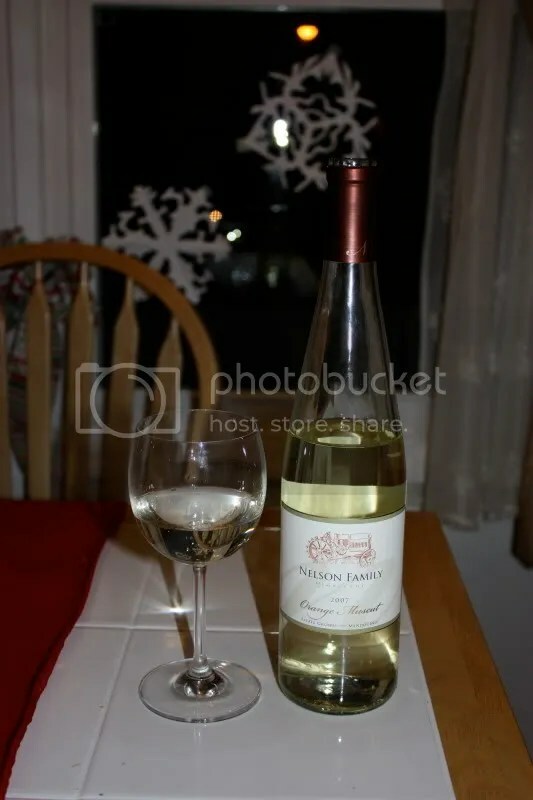 The citrus really gives the wine body and makes it a great after dinner sipping wine. A great value.